Phew. First workday – done. 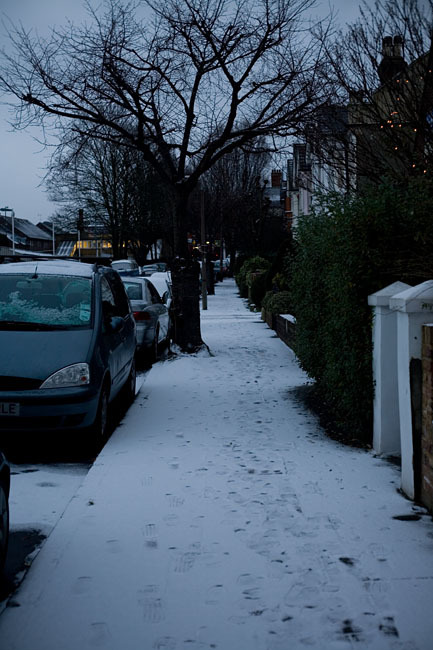 It was a bit of a shock to the system to first of all wake up to a snowy and freezing London, and then get out of bed when every fibre of my body was convinced it was still night time! It was also a bit difficult to get my ‘work head’ on at first, but by mid day it all started feeling like I’d never been away… Not sure if that’s a good thing. I’ve decided to ignore my to-do-list for tonight. So there. Ewwww, doesn’t sound very encouraging when I think of tomorrow morning: _how_on_earth_ to get UP??? I already can see myself groping my way in the middle of the darkness from bed to bathroom. NO fun! Oh mikä kuvapläjäys Cornwallista. Kaunista. Onko Holga-kuvat vielä kamerassa? Hain tänään filmit kehityksestä. Pitäs vielä kehitellä jostain aikaa skannata. 😛 (vaikka aika samoja tuotoksia sieltä tuli ku viimekski, ei ollu maisemat siitä paljon muuttunu). It’s been freezing cold in Pairs too and we don’t seem to see the end of it. This morning at nine the thermometer was at minus two, yikes!